SPARKMAN& STEVENS YAWL ODYSSEY ! 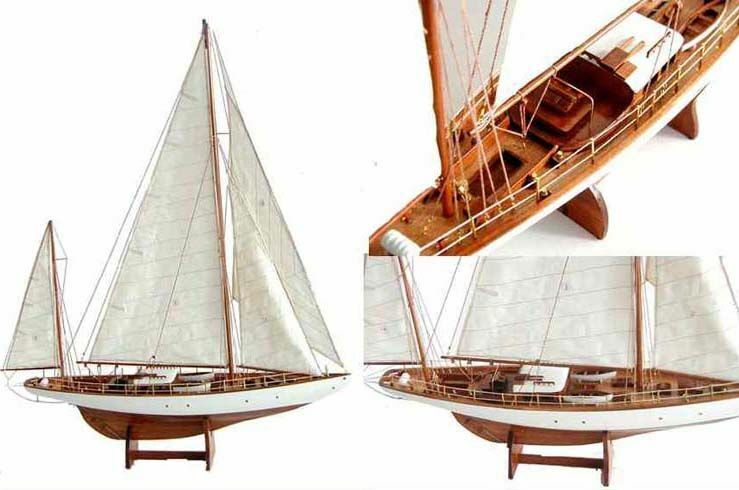 Presented is an exceptional model of the contemporary yawl 89 foot ODYSSEY which is offered in completed form at an unusually reasonable price. She is built using plank on bulkhead wood construction in the same manner as the original, plank by plank, and then finished in seven coats of high gloss enamel and varnish. Our replica of the original ODYSSEY features a Marconi main mizzen and clubfooted forestaysil, and jib, all with carefully stitched sails. Everything is done properly to make this an incomparable model. It has a beautifully enameled white hull with varnished cap rails, deck houses, and decks. Measurements are 29 1/2 LOA", 36" high (base to the top of mast) by 5 1/2 wide. Please don't confuse our models with others you see on ebay. All MODELS are NOT CREATED EQUAL. There is no comparison to our replicas at near this price. Before you buy, make sure to look at all photographs carefully. Ours will show a model of unparalleled quality and faithfulness to the original builder's plans. Give-always are the rake of the masts, the proportions of the hull, and the cut of the bow. If you're in doubt, email us! OUR NO NONSENSE GUARANTEE OF SATISFACTION: If not completely satisfied with your purchase it may be returned, if without damage, within three days of receipt in its original packaging. Return items must be insured for their full value. Only a prior email authorization by us for the return is required. Refund will be made for the cost of shipping, packaging and handling within the continental United States if we are at fault. Two brothers, Olin J. Stephens and Roderick Stephens, Jr., began their careers as self-taught sailors on Barnstable Bay, Massachusetts. Both entered the marine industry at an early age - Olin apprenticing in yacht design under Phillip Rhodes, and Rod working at the legendary Nevins Yard in City Island, New York. With his father's backing, the 21-year old Olin entered into a partnership with the already successful yacht broker Drake Sparkman, and Sparkman & Stephens, Inc. was formed. But the success of the company was far from assured. In fact, just months after opening for business, the financial crisis of the Great Depression swept the global market. In spite of this, the Stephens' father ordered a design for a racing yacht from the young firm - a yacht named Dorade. That gamble paid off. As her first major test, Dorade won the much-publicized 1931 Trans-Atlantic Race. That victory launched the design reputation of Sparkman & Stephens - and set a course for the firm that would last more than half a century. Together Olin and Rod Stephens formed a team that literally changed the face of yachting forever, creating good solid racing and cruising designs that helped to popularize the sport. 1931 Transatlantic & Fastnet Races (won by Dorade) Since the establishment of Sparkman & Stephens, the firm has successfully completed over 2600 designs and related assignments in the pleasure, commercial and military sectors. Best known for the design of sailing yachts, the firm has branched out as it has continued to grow over the years. Today the company is organized into two departments, one focused on design, naval architecture and marine engineering and the other handling the brokerage, chartering, and insurance of yachts. HISTORY OF THE ODYSSEY: The S&S yawl "Odyssey" was built for the DuPont family in the 1930's, she was commandeered by the U.S. Navy in 1942, painted completely gray and used for anti-submarine patrol off the West Coast during WW2. She remained in Navy hands until the late 1980's when she was decommissioned and given to the Boy Scouts of America. She is presently fully restored and is used by the Sea Scouts as a sail training ship, and is lying in Tacoma, Washington. A reader writes in November, 2010, "I notice your listing for the Odyssey states it was built and owned by the DuPont family. She was actually commissioned by Mr. Barklie McKee Henry, who was married to Barbara Whitney the grand daughter of Cornelius Vanderbilt II. There is a story referring that the Odyssey was an anniversary present for Barklie from Barbara." "The Odyssey was launched in 1938 at Henry Nevins City Island Yard, City Island New York."